劇場空間 Theatre Space – Hong Kong Heritage Museum has organised the Sai Fung 1959 – Exhibition x Drama Multi-arts Programme Series. 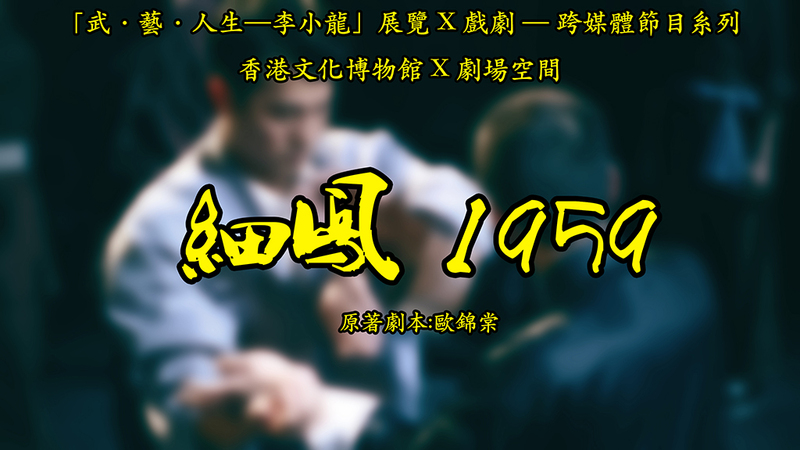 Hong Kong Heritage Museum has organised the Sai Fung 1959 – Exhibition x Drama Multi-arts Programme Series. To complement the three-year anniversary of the “Bruce Lee：Kung Fu‧Art‧Life” Exhibition and in memory of Bruce Lee, the international martial arts superstar who passed away 43 years ago, Hong Kong Heritage Museum has organised the Sai Fung 1959 – Exhibition x Drama Multi-arts Programme Series. With the exhibition content as the base, Bruce Lee’s teenage life in Hong Kong will be portrayed in theatre. The programme series consists of 20 sessions of Sai Fung 1959 musical performances staged in the museum theatre, presented in an hour-long musical about the day before Bruce Lee’s departure to America. The programme series includes 14 site-specific performances in the exhibition gallery and one sharing session hosted by Mr. Stephen Au, the playwright of the original musical.